Oh my GOODNESS! I think this episode rings to be the Working Girl’s Shoe Closet *most* favorite Project Runway episode yet! Ms. Nina Garcia is such an icon for me because she projects the very essence of the ultimate Working Girl Fashionista. This week’s challenge to design her a perfect day-to-evening look brought out what has been lacking in our expansive fashion world. And the difficulty the designers had in trying to create something fashion forward that is office appropriate and can transform to evening flair equals the challenges all the rest of us working girls face in trying to shop and dress in the morning every day. So, for all you newbies to my blog, ‘What Would Project Runway Shoe?” (#WWPRS) is about pairing a shoe or two with the winning look of the week. SPOILER ALERT! Stop reading if you want to wait and watch the episode first before reading about the winning design. We got wowed on the runway with three really fantastic chic day to night designs by Anya (#PR9Anya), Kimberly (#PR9Kimberly) and Viktor (#PR9Viktor) but it was Kimberly that took the top prize. Her impeccable, now signature, tailoring of the well proportioned pants with the wide leg was the perfect foundation for the shiny gold asymmetric sleekly fitted top. The balance and range of the top’s shine and the dark pant make a seamless transition from day to evening. And as such, I’ve chosen one day and one evening shoe. For the day shoe, I really wanted a red shoe. I felt that an office design this bold and confident needed to not be outshined by an equally bold and confident shoe. 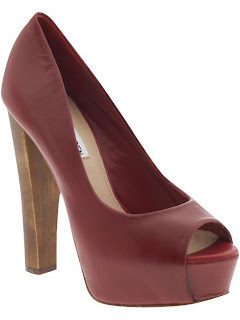 My Piperlime search led me to these Steve Madden ‘Felicite’ as the exact shoe that I was looking for the day look. I loved this shoe for many reasons. The first, and most obvious, was the color. Like I said, this is an outfit that has confidence as its most fabulous accessory, so only red can really stand up to it. The peep toe helps to keep the look from feeling too covered. Because the outfit consists of pants, you need a balance of some skin. The 5” heel with a 1 ¼” platform gives you the extra height that every girl needs when wearing pants. And as of late, Steve Madden’s platforms have been increasingly more and more cushioned to help you run around in your heels with more comfort. The chunkier heel also helps give you more stability to avoid those wobble moments when dealing with urban terrain. No matter how tall you are, or aren’t, using the magic of an elongated line that you get from a dark pant coupled with the added enormous platform height, you establish yourself as a fabulous working girl fashionista with this pulled together ensemble. Joanna Cole underscored her eloquence in her commentary. She captured exactly what fashion’s role for working women should be in that it should make us feel like the queens of the cubicles when filling out our expense reports and time sheets. Fashion should make us feel empowered not entrapped. She reminded me why I absolutely adore her AND how amazing she’s made Marie Claire magazine.